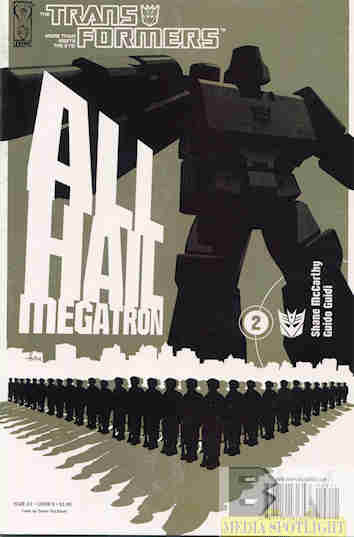 A dinner party for his wife is interrupted when Colonel Witwicky is called in to deal with the giant robots. One of the pilots survived and is being hunted by Ravage. He and a civilian are rescued by other civilians. Meanwhile, the army moves in on Central Park, so Soundwave releases Frenzy, who in this continuity is always creating his sonic field and causing nightmare visions in everyone, even himself. The squad sent in is destroyed, and then Megatron ups the ante by having the Constructicons combine into Devastator and go after the underground subway tunnels by flooding them. What they got right: I still like the concept and in this case the devastation makes a bit more sense. The art is very good. Recommendation: I remember enjoying this series more when it first came out. I think I was caught up by the concept. While the story isn’t bad thus far I’m seeing more flaws than I did last time. Still mildly recommended for the concept though. Posted by ShadowWing Tronix on April 5, 2018 in Yesterday's Comics and tagged Chris Ryall, Decepticon, Frenzy, Guido Guidi, IDW Publishing, Megatron, Ravage, Shane McCarthy, Soundwave, Sparkplug Witwicky.